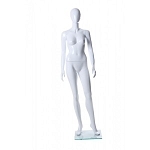 This Full Body Fleshtone Female Mannequin With Head Is A Inexpensive Way To Display Your Latest Fashions. The Full Body Mannequin Comes With The Hands On The Side. Wig Sold Separately. 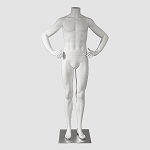 Mannequin Is Made From Hi Quality Plastic Construction. Mannequin Also Comes With A Squared Tempered Glass Base. The Height Is 5'9", Bust Is 33", Waist 24", Hip 33-1/2". Shoe Size of The Mannequin Is 6.